This page provides a chart depicting the the quality ranks of automobile brands for 2000, 2005, and 2010. The statistics used in the computations for ranking the car brands are those found within the April issues of Consumer Reports. The section providing the necessary statistics is that containing CR's reliability charts. Reliability is defined by the magazine as the infrequency of serious problems, which it measures annually by a subscriber survey. The chart below provides the ranks of auto brands based on the average of the overall reliability ratings of each brand's models. This ranking provides a measure of how well a brand's models performed over the entire model-quality spectrum in each of the years 2000, 2005, and 2010. To compute car-brand quality ratings and compute a quality rank using Consumer Reports' overall reliability ratings, a number is first associated with each of CR's overall ratings. A +1.0 is ascribed to a rating of Much Better Than Average, a +0.5 to a rating of Better Than Average, a 0 to a rating of Average, a -0.5 to a rating of Worse Than Average, and a -1.0 to a rating of Much Worse Than Average. Then an average is taken over all of the brand's model years and models offering an overall reliability rating. 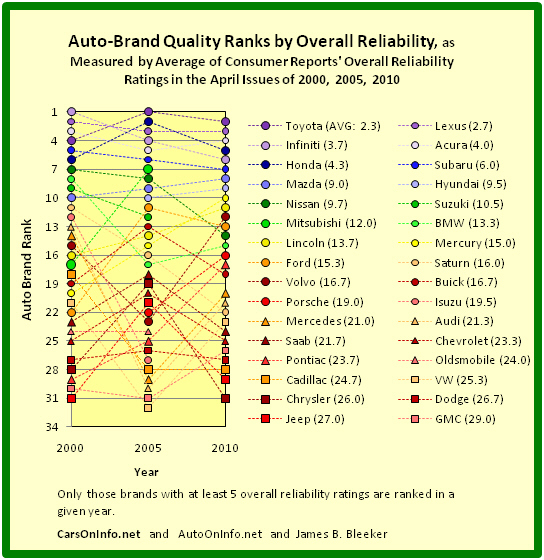 Lastly, the automobile brands with at least 5 overall reliability ratings are ordered from best to worst for each of the years 2000, 2005, and 2010. The best brand in a given year has a quality rank of 1. The worst quality rank varies from year to year and ranges from 30 to 34. Automobile brands with a rank in at least one year include Acura, AMC, Audi, BMW, Buick, Cadillac, Chevrolet, Chrysler, Datsun, Dodge, Eagle, Fiat, Ford, GMC, Honda, Hyundai, Infiniti, International Harvester, Isuzu, Jaguar, Jeep, Kia, Lexus, Lincoln, Mazda, Mercedes-Benz, Mercury, Mini Cooper, Mitsubishi, Nissan, Oldsmobile, Peugeot, Plymouth, Pontiac, Porsche, Saab, Saturn, Scion, Subaru, Suzuki, Toyota, Volkswagen, and Volvo. The quality ranks of the above car lines by this set of computations are given in the graph below. In the graph above, the 3-year average of each brand's ranks appears in parentheses after the brand's name. The missing top brand of 2010 is Toyota Motor Corporation's Scion. The graph has three interesting features. 1. In the bottom half of the graph, there are primarily accentuated V-shaped (down-then-up) and Λ-shaped (up-then-down) paths with generally little overall change from 2000 to 2010. While these paths may represent sizable short-term quality shifts in brands, more likely is that they are random fluctuations and reflect the likelihood that most of the brands in the bottom 1/2 of the spectrum are of the same ilk, with little quality difference. Consequently, if a consumer is considering a brand in the bottom half of the class, nearly any other brand at that depth should work as well. 2. The Top 6 brands remain rather constant in their rank, with changes of 5 places or less. This has two implications. a. A person looking for a good car may rather safely choose from any of the Top 6 brands. b. A person looking for an excellent car may rather safely choose the best model of any of the Top 6. To choose the best model, check their	GPAs. 3. The pronounced upward movement of Ford Motor Company's brands have brought them to mentionable heights. The Mercury line has moved from 20th place in 2000 to 10th place in 2010, the Ford line has moved from 22nd place to 13th place, and the Lincoln line has moved from 16th place to 11th place. Consequently, those consumers who are looking to buy a good car from Detroit should look at the best of Ford Motor Company's cars. [Disclosure: Site manager is a very small shareholder of Ford.] To select the best by Ford, check model GPAs.